Farthing, A. & Priego, E. (2016). Data from ‘Graphic Medicine’ as a Mental Health Information Resource: Insights from Comics Producers. Journal of Open Health Data, 4(1), e3. doi: 10.5334/ohd.25. http://openaccess.city.ac.uk/15251/. Grennan, S., Priego, E., Sperandio, C. & Wilkins, P. (2017). Parables of Care. Creative Responses to Dementia Care, As Told by Carers. City, University of London, University of Chester, Douglas College. ISBN 978-1-5272-1200-8. Available from http://openaccess.city.ac.uk/18245/. Maiden, N., Kirtley, A., Zachos, K., & Lockerbie, J. (2016). 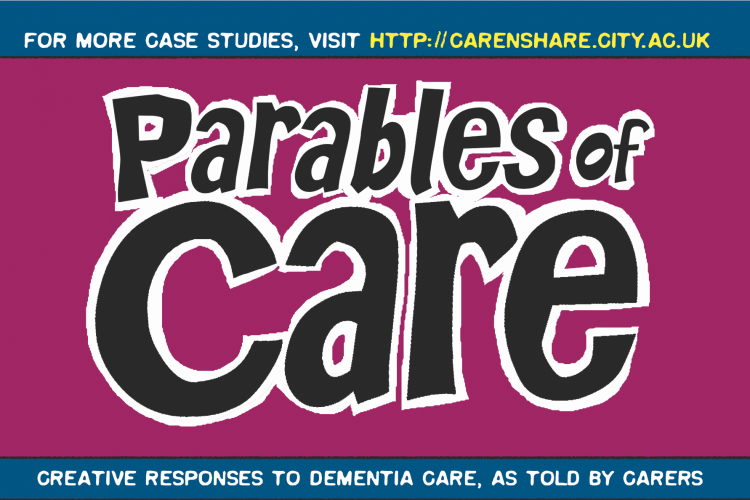 Care’N’Share, available at http://carenshare.city.ac.uk/. Priego, E. & Farthing, A. (2016). ‘Graphic Medicine’ as a Mental Health Information Resource: Insights from Comics Producers. The Comics Grid: Journal of Comics Scholarship, 6, doi: 10.16995/cg.74 http://openaccess.city.ac.uk/13441/. Research presented at the Graphic Medicine Conference 2016, 7-9 July 2016, University of Dundee, UK. Priego, E. (2016). Comics as Research, Comics for Impact: The Case of Higher Fees, Higher Debts. The Comics Grid : Journal of Comics Scholarship, 6, 16. doi: 10.16995/cg.101/. http://openaccess.city.ac.uk/16156/.